Escape To Sparkling Shores & Relax In The Ocean Breeze. At Regency Towers we provide privacy, stunning oceanfront views, relaxation and an uncrowded atmosphere in an exclusive seaside setting. The spacious accommodations, friendly staff, upscale amenities and sweeping views create the ideal vacation. 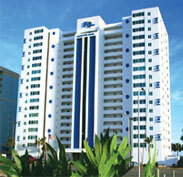 Regency Towers is nestled in along the Grand Strand coast in South Myrtle Beach. This less congested area brings you just footsteps from the beach. Enjoy nearby shopping, dining, exhilarating nightlife and entertainment. Plus, Myrtle Beach is home to more than 100 golf courses that are just a short drive away. Myrtle Beach and Regency Towers has something to offer for everyone. Where Each Day Is Unforgettable. We proudly feature the finest in two and three bedroom luxury oceanfront accommodations. All of our spacious condominium resort homes are fully furnished for your convenience. Stay in shape while you're with us and enjoy a vigorous workout in our exercise room and then enjoy our relaxing sauna. Or if you prefer you could spend some time lounging by our large oceanfront pool. Escape the harsh realities of work, northern winters and spend some time with us at Regency Towers. No matter what season it is, we are always open and ready to help you relax. Regency Towers is centrally located in Myrtle Beach, SC and is just minutes from the Convention Center, Broadway at the Beach, Sports events and more!